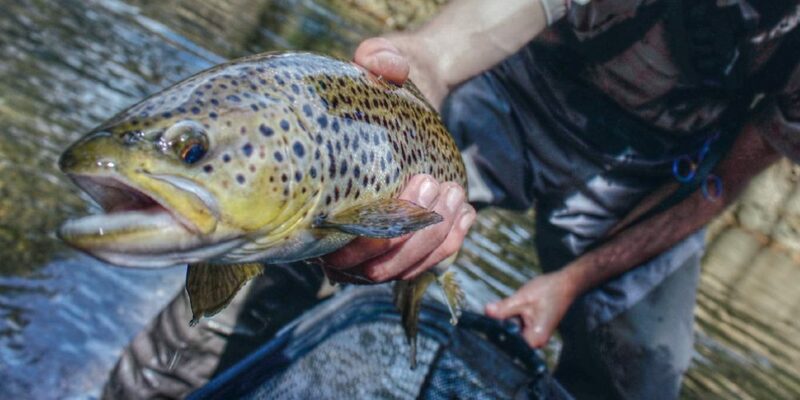 Each spring around 17,000 trout are dropped into the 4,000 miles of North Carolina mountain trout streams. These western North Carolina streams and rivers have long been considered a haven for fly-fishermen looking to test their angling skills in a beautiful and oftentimes rugged environment. In Brevard and Transylvania County alone, fishermen can choose to fish the nearly 500 miles of creeks, streams and rivers that run through the steep mountains and rich forests. This rich diversity and bountiful water supply make the area one of the top destinations in the southeast for fly fishing. For local fishing guides like the ones we showcased in this Brevard fly fishing video who spend a great deal of their time guiding clients on the rivers, the diversity of the county’s waterways and the bountiful fish populations that thrive in the cool mountain water helps keep them and their clients satisfied day in and day out. For more information on the great folks who appeared in this video and to book them for a day on the water, check out www.davidsonflyfishing.com. Landon Lipke, a California native who has been a guide at Davidson River Outfitters for five years, said one of his favorite rivers in the area is the Davidson. He said that the hatchery located near the headwaters of the river creates ideal conditions for trout. While most of the Davidson River is only a “stone’s throw” from the road, Lipke said for the most part it doesn’t feel that way. Above the hatchery, the river narrows into a smaller stream that offers a true wilderness setting, he said. “You can get away from people and still catch bigger fish, unlike some of the other small streams in the area,” he said. Lipke said that the average size trout in the river is around 14 inches, but that’s not the only size fish to be caught there. Lipke said that what makes the river such a fun place to fish is the variety. Lipke said that in order to be successful, anglers would need to work to figure out what the fish are feeding on at each spot. Lipke said that he thinks spring fishing makes for some of the most exciting fly-fishing of the year. Lipke said that while the spring hatches are fairly hit or miss, when they happen it makes for a great day of fishing. Lipke said that it takes anglers utilizing trial and error to determine what the fish are feeding on. When an angler finds something the fish is hungry for, it makes for a fun afternoon, he said. Around 14 miles of the river, from its headwaters to Avery Creek, are managed under catch-and-release, fly-fishing only regulations. The lower mile is hatchery supported.